Note: The Widow Douglas Garden Mix & Dinette Horseshoe do not include a side. If your meal includes a side and no option is selected the default side is fries. Thank you for your RSVP! A confirmation email will be sent as soon as possible. 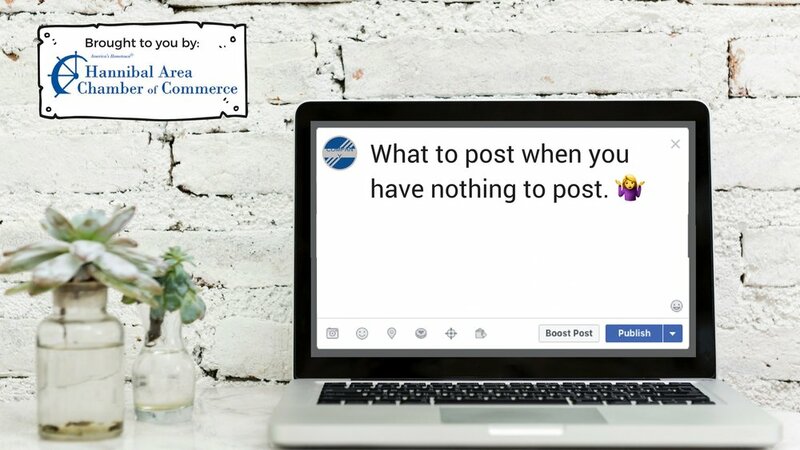 Introducing a new Luncheon Mini-Series presented by the Hannibal Chamber of Commerce to learn more about social media marketing and how it impacts your business. Each luncheon will open with a meal and networking followed by presentations by guest speakers. The first guest speaker will be Kenna Bogue from the Mark Twain Dinette presenting ‘What to Post When You Have Nothing to Post’. Regular posts is a key social media strategy. But what do you post when you are staring at a blank screen with zero ideas? Attendees will learn strategies and resources for generating a portfolio of unique social media content with little to no marketing or design experience required. This event is FREE to our chamber members - the only cost is for your meal. Our hosts at the Mark Twain Dinette have created a special discounted menu options including beverage for our chamber members for this event for $12 (gratuity included). Dinette Horseshoe: Your Dinette Favorites combined into one dish - an open faced Maid-Rite on Texas Toast topped with onion rings, cheese sauce, and chili ranch.